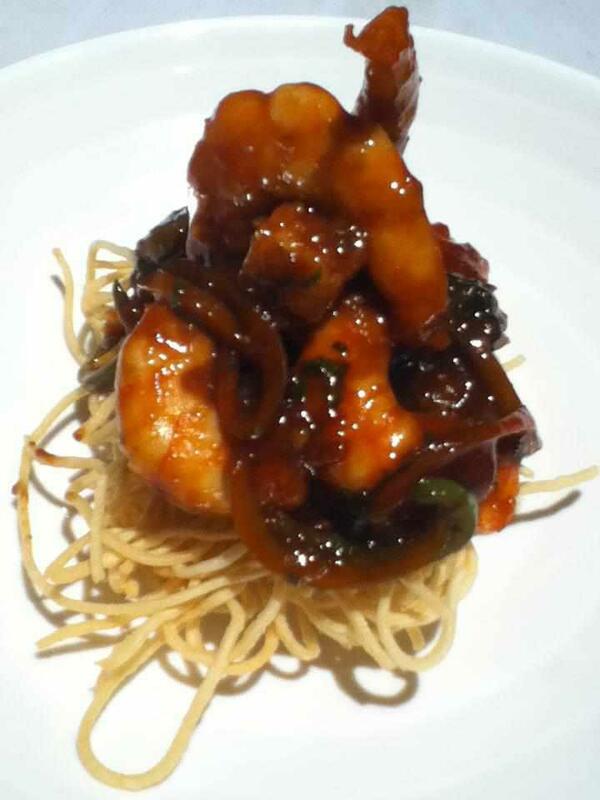 Here's Sarap Diva Recipe- Kung Pao Shrimps. 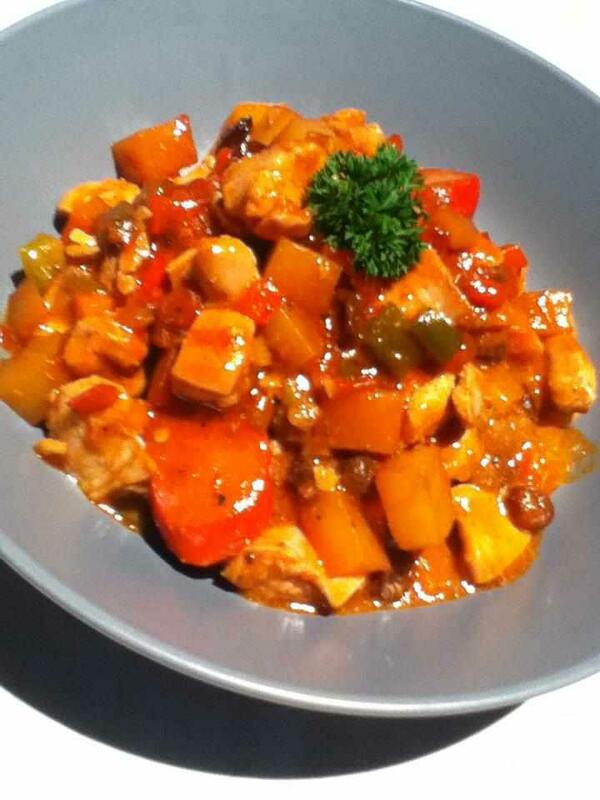 Here's Sarap Diva Recipe- Chicken Menudo by Kyla and Rich. 5. Add the sliced hotdogs. Then add the chicken. 7. Add raisins. Let it simmer. Continue until sauce thickens. Here's Idol sa Kusina Recipe- LECHON PAELLA DE LECHE. 1. (Using the Ariston free standing cooker) In a pan, heat oil and saute chorizo, onion and garlic. Add seafood, rice, tomatoes and bell peppers. 2. Add in rice and saute for a minute. Add stock and saffron and cook until almost done. 3. Season the pig’s cavity with salt and pepper, then brush with milk and alittle oil. Then stuff the paella inside the cavity of the pig and roast the pig. 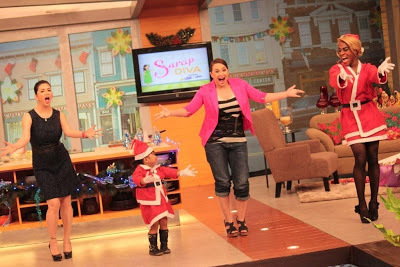 Pure joy comes in small package in this episode as noontime child wonder Ryza Mae Dizon teaches viewers how to do her signature cha-cha dance, and shares how her recent success has brought new light on how she and her family celebrate Christmas this year. 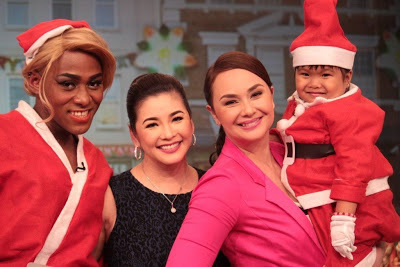 A yuletide melody punctuates this fun yet heart-warming episode as Regine sings a classic Pinoy favourite that will surely make viewers feel the holiday spirit even more. This Saturday (December 22), unwrap Sarap Diva’s special gift for Kapuso viewers as it presents a morning of good food, engaging conversations and great music perfect for the most special day of the year – Christmas! Join Asia’s Songbird Regine Velasquez-Alcasid as she prepares a special Christmas feast for the whole family! Danica Sotto shares her Beef Kare-Kare recipe and gives out practical tips on how to make the feast more delicious and tasty. Donita Rose brings in her spicy pork specialty, fresh-off her culinary schoolgraduation. Adding up a little twist to the lively feast is the Songbird herself with her Beef Wellington dish that is surely fit for royalty. 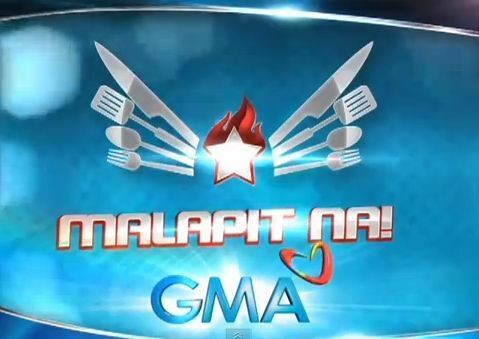 Join the feast, enjoy the talk, and savor the music this Saturday in Sarap Diva, 9:40 am, on GMA. 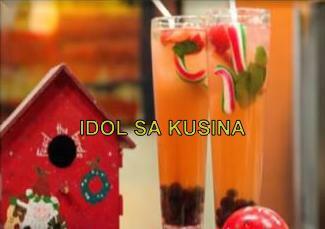 Here's Idol sa Kusina Recipe for Episode 74 / Dec. 16- STRAWBERRY CHRISTMAS PUNCH. 2. Add apple cider. Slowly add lemonade and serve. Garnish with candy cane. 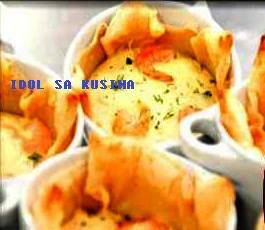 Here's Idol sa Kusina Recipe for Episode 73 / Dec. 16- MINI SHRIMP QUICHE. 1. PREHEAT OVEN TO 400 DEGREES F. GREASE MINI-MUFFIN PANS. 2. ON A LIGHTLY FLOURED BOARD, PLACE UNFOLDED THAWED PUFF PASTRY SHEET AND ROLL OUT INTO A RECTANGLE ABOUT 12 X 14 INCHES AND 1/8-INCH THICK. USING A 2-1/2-INCH BISCUIT CUTTER, CUT 24 ROUNDS. FIT ROUNDS INTO MINI-MUFFIN CUPS. PLACE 1 OR 2 BABY SHRIMP INTO EACH CUP. 3. BLEND CREAM CHEESE, DRY MUSTARD, DILL WEED, GARLIC POWDER, ONION POWDER, SALT, AND SOY SAUCE UNTIL SMOOTH. BEAT IN EGGS, ONE AT A TIME, JUST UNTIL INCORPORATED. FOLD IN CHOPPED CHIVES. 4. SPOON EGG AND CHEESE MIXTURE OVER SHRIMP IN EACH CUP. TOP WITH A SPRINKLING OF GRUYERE OR SWISS CHEESE. 5. BAKE 10 MINUTES UNTIL PUFFED AND GOLDEN. SERVE WARM. 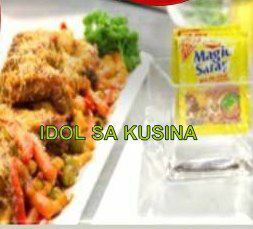 Here's Idol sa Kusina Recipe for Episode 74 / Dec. 16- BEEF OSSO BUCCO CALDERETA with QUESO DE BOLA. 1. In a casserole over moderate fire, heat olive oil and sear the beef shanks until sides are brown; remove from heat. 2. Add the onions, garlic, bell pepper, and bay leaves, and sauté for 3-5 minutes. Return the beef shanks in the casserole, then add the soy sauce, tomato paste and sauce, and beef stock. 3. Cover the casserole and let the mixture simmer for 1- 1 ½ hours, or until the meat becomes tender. 4. Then add the Maggi Maggi Sarap, ground black pepper, carrots, garbanzo beans, and green olives, and let simmer for another 10 minutes. 5. Add all the queso de bola lastly. Drizzle with more olive oil, if desired. 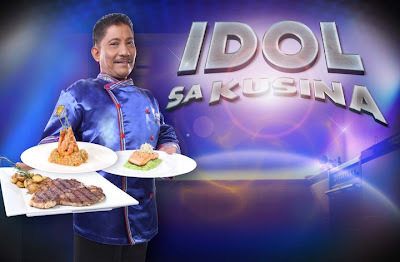 Here's Idol sa Kusina Recipe for Epsiode 74 / Dec. 16- CRUSTED LAMB RACK WITH MINT JELLY SAUCE. 1. SEASON WITH SALT AND CRUSHED BLACK PEPPERCORN, BRUSH WITH MUSTARD FRENCH CUT LAMB RACK. 2. PAN SEARED FOR 5 MINUTES BOTH SIDES AND. DE-GLAZED WITH BRANDY. 3. MIX INTO BOWL SOFTENED BUTTER, BREAD CRUMBS, BASIL, PARSLEY, PEANUTS, MUSTARD, AND EGG YOLK. 4. PLACE IT ON BAKING PAN, THE SEARED LAMB RACK, AND THEN COVER ON TOPPED WITH THE MIXTURE OF BREADCRUMBS AND HERBS,NUTS. 5. HAVE READY HEATED OVEN 350° C THEN ROAST THE CRUSTED LAMB RACK UNTIL GOLDEN BROWN, THE CRUST. 7. SIDINGS WITH DUCHEES BAKED MASHED POTATO. 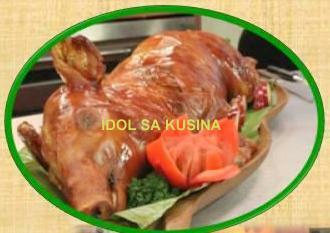 Have you watched Idol sa Kusina Christmas Episode 2012 on December 16, 2012? 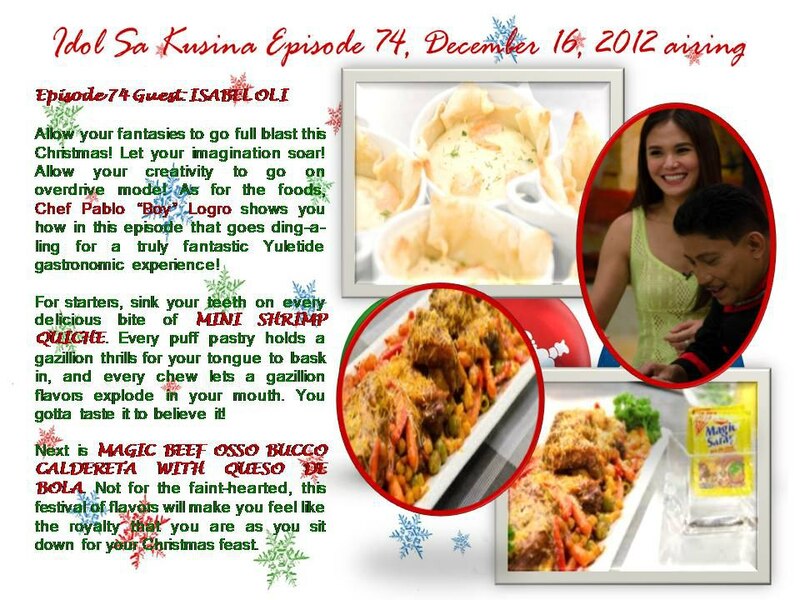 Idol sa Kusina Episode 74-Christmas special aired on Decmber 16 with celbrity guest Isabel Oli. 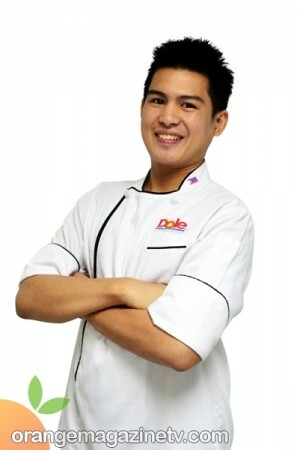 Chef Boy Logro prepares Mini Shrimp Quiche and MAgic Beef Osso Bucco Caldereta with Queso De Bola. Jollibee Christmas Party 2012- how to book? Christmas parties are in full swing! Let Jollibee easily help you plan and book the happiest party today! 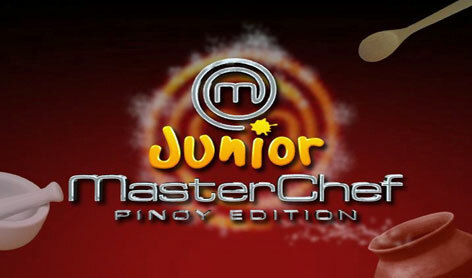 Visit www.jollibeeparty.com for more details! Fast-food giant Jollibee made birthday party and Christmas Party bookings easier than ever. 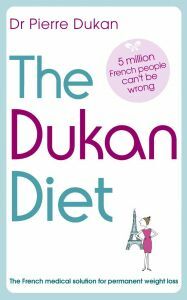 The Dukan Diet: The French Medical Solution for Permanent Weight-loss. The real reason French women don't get fat! Step 1: Attack For 2-7 days eat as much as you want of 72 protein-rich foods. Step 2: Cruise Continue eating the protein-rich foods with the addition of 28 vegetables. Step 3: Consolidation Add fruit, bread, cheese and starchy foods, and 2 celebration meals a week, allowing 5 days for every pound lost. Step 4: Stabilisation Eat what you like without regaining weight by following 3 simple rules, including the famous 'protein Thursdays'. Devised by Dr Pierre Dukan, a French medical doctor who has spent his career helping people to lose weight permanently, The Dukan Diet is the culmination of thirty-five years' clinical experience. Without any of the usual marketing hype, The Dukan Diet swept across France, championed by the people who had successfully lost weight following the diet. It is now estimated that the Dukan community numbers over 5 million people in France. Easy to follow with no calorie counting, The Dukan Diet offers clear simple guidelines, menu planners and delicious recipes for long term success. Beyond its immense success in France, The Dukan Diet has been adopted by 20 countries and translated into 10 languages. Many international observers agree that this is the method most likely to put a stop to the world's weight problems. Dr Pierre Dukan has been a medical doctor specializing in human nutrition since 1973. He the author of many works on nutrition, scientific works as well as those for the general public, and regularly writes in the press and appears on television. The popularity of Dr Dukan's methods and works in countries as different in culture as Korea or Bulgaria show how he has become the most widely-read French nutritionist in the world. At some online store you can buy the book for only $16 dollars. Catch Coke Polar Bears now available at McDonalds. Last stretch before the Christmas break! 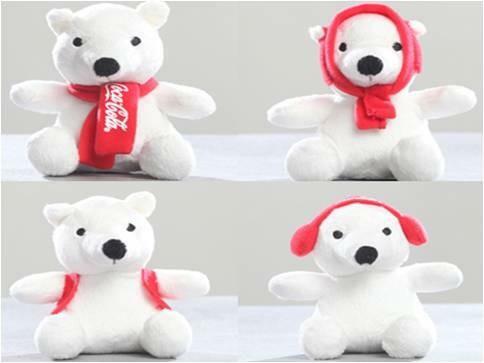 Put some holiday feel to your work tables with cute Coke Polar Bear toys! Get 4 of these plush toys by ordering #HappyBundle and upgrading your drinks to large size or Coke Float. Celebrity And host of Deal or No Deal Luis Manzano tweeted, "Yes, guys!! Have @mcdo_ph #HappyBundle delivered, upgrade to Large drinks and these Coke Polar Bears are yours!" Here's Fudz Republic of the Philippines Recipe- Adobong Sitaw ( String Beans). 1. Heat oil on a pan over medium flame. Saute garlic and onions. Add pork. Add salt and pepper to taste. Cook pork until almost brown. 2. Add water and bring to a boil. Lower down the heat and simmer for about 15 minutes. 3. Add the toyo, vinegar, and sitaw. Simmer for another 10 minutes. Here's Fudz Republic of the Philippines Recipe- Maja Blanca. This is a perfect recipe on the upcoming Holiday, Merry Christmas. 1.) 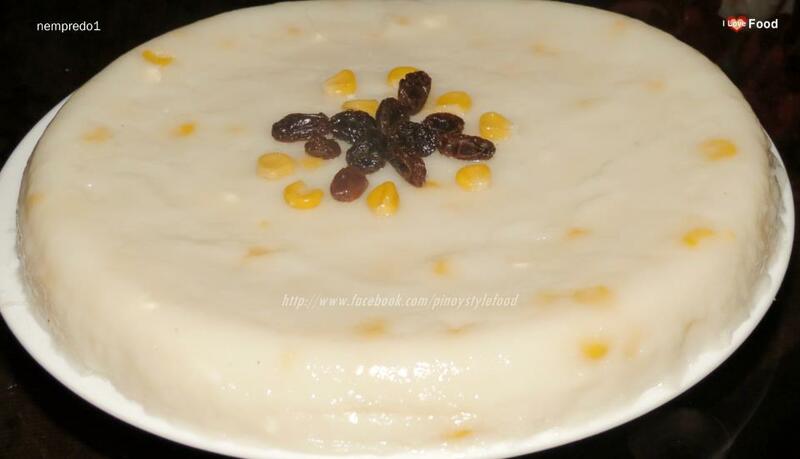 In a pot, add 1.25 liters of coconut milk, white sugar, condensed milk, evaporated milk, corn kernels. *On a mixing bowl put shifted flour, butter, beaten egg, water and pinch of salt mix until you can make dough, rest the dough for 1 hour and cover. *After hour Roll dough out on a lightly floured board to circles about 2-3 inches in diameter, dough should be flatten thin. *Place a teaspoon of empanada filling into empanada shell. Moisten the edges of the circle with a small amount of water and press the edges together to seal using tip of the fork. 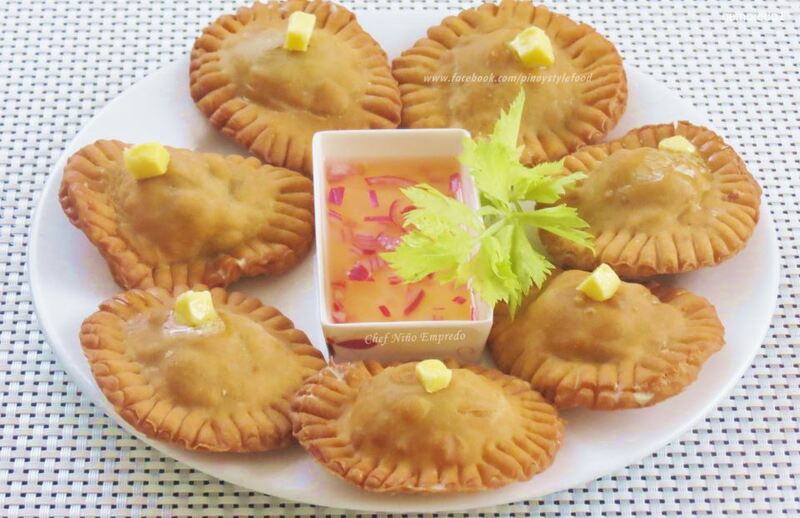 *On a deep fryer heat up cooking oil in medium heat temperature to avoid over cook , when empanada rises in oil and golden brown in color you can remove into fryer and ready table napkin to remove excess oil. On a frying pan put 1 tablespoon cooking oil sauté onion, celery, tomato and ground pork add pinch of salt and pepper to taste, cook until lightly brown. 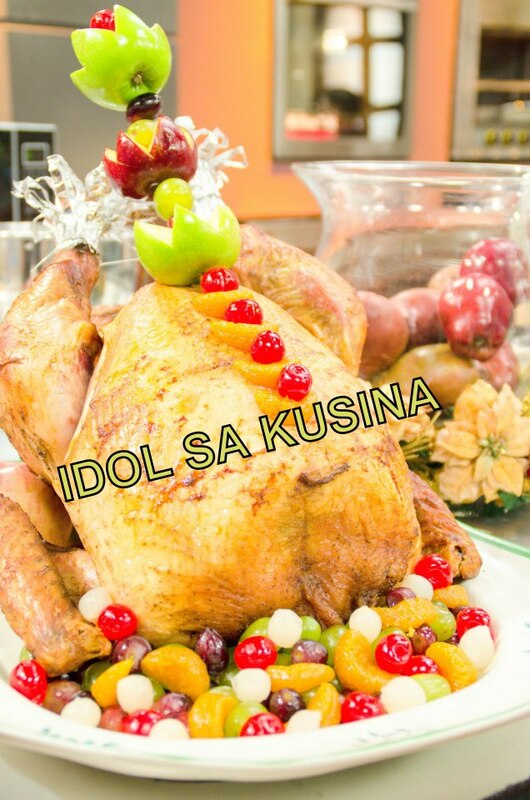 Idol sa Kusina Recipe for Episode 73- Dec. 9, ROASTED TURKEY WITH MAPLE MUSTARD SAUCE. 1 WHOLE TURKEY ABOUT 5KLS. 1. MIX GARLIC POWDER, SALT, CORIANDER, AND PEPPER TOGETHER. 2. LIGHTLY OIL TURKEY BREAST. RUB SPICE MIXTURE INTO TURKEY BREAST. 3. BAKE TURKEY BREAST IN A SHALLOW ROASTING PAN AT 325°F (160°C) UNTIL INTERNAL TEMPERATURE REACHES 170°F | 75°C (ROASTING TIME FOR A 4 TO 6 POUND TURKEY BREAST IS APPROXIMATELY 1 1/2 TO 2 1/4 HOURS; A 6 TO 8 POUND BREAST TAKES 2 1/4 TO 3 1/4 HOURS). LET TURKEY BREAST REST FOR 15 MINUTES BEFORE SLICING. SERVE WITH MAPLE MUSTARD SAUCE. 4. FOR MAPLE MUSTARD SAUCE: MIX TOGETHER THE DIJON MUSTARD AND MAPLE SYRUP. 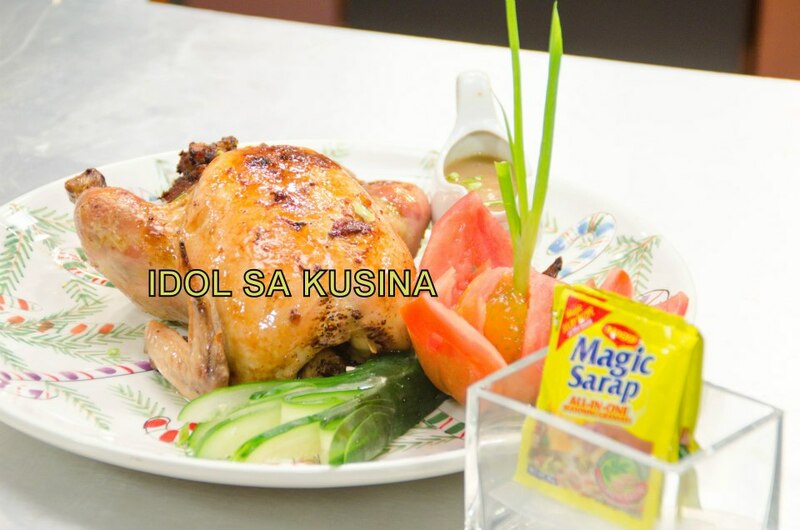 Idol sa Kusina Recipe- Episode 73, Dec. 9- MAGIC STUFFED ROAST CHICKEN. 1. For the brine: Mix all ingredients in a non-reactive container. Ensure that chickens are submerged in water. Leave to brine inside the refrigerator for at least 12 hours. 2. In a sauté pan, melt butter. Add longganisa and bacon. Cook for 8-10 minutes. Set aside to cool. 3. 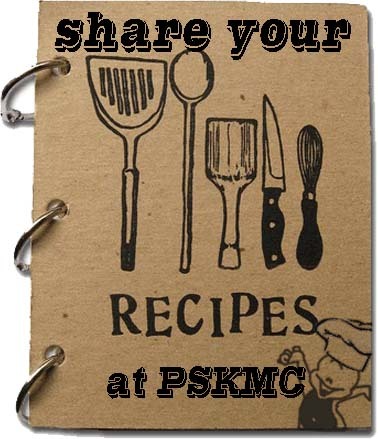 In a stockpot, boil squash, carrots, sweet potatoes and potatoes in water until tender. Drain, then mash. 4. Combine mashed vegetables with remaining ingredients, including longganisa and bacon. Mix well and use to stuff cavity of brined chickens. Cover in foil. 5. Roast in a preheated 350F oven, at the bottommost rack. Remove foil after 30 minutes. Brush with MAGGI MAGIC SARAP dissolved in water every 10 minutes. Brush with butter during the last 10 minutes of roasting. Cooking time is approximately 1 hour 45 minutes. Blurb: Place excess stuffing in a baking dish and cover with foil. Bake alongside chicken and serve on the side. 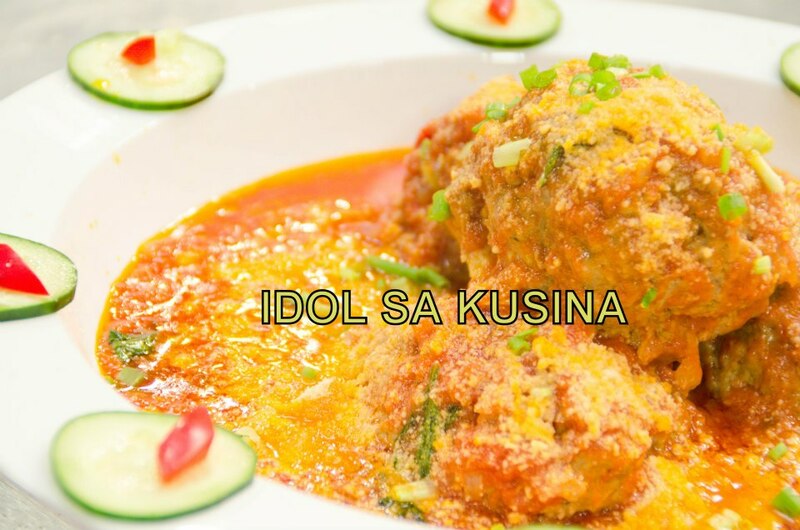 Here's Idol sa Kusina Recipe for Episode 73- Dec. 9 GIANT MEATBALLS W/ TOMATO, CHILI, and ANCHOVY SAUCE. 1. TO MAKE THE SAUCE: HEAT THE OIL IN A LARGE HEAVY BASED SAUCEPAN (THAT CAN GO IN THE OVEN). 3. SIMMER FOR 30 MINUTES. NOW ADD THE BASIL. 4. PRE HEAT THE OVEN TO 200?C. 1. MIX THE VEAL AND PORK MINCE WITH RICOTTA, EGG, PARMESAN, BREAD CRUMBS, PARSLEY, THYME, TOMATO PASTE AND THE GARLIC. SEASON WITH SALT AND PEPPER. COMBINE WELL WITH YOUR HANDS. 2. FORM THE MIXTURE INTO LARGE BALLS (SIZE OF A TENNIS BALL). PIERCE THE MEATBALL WITH THE MOZZARELLA AND ENSURE YOU SEAL WELL WITH THE MEAT. PLACE MEATBALLS ON TO A TRAY AND BAKE IN THE OVEN AND COOK FOR 15 TO 20 MINUTES. 3. ONCE COOKED, ADD THE MEATBALLS TO THE SAUCE, AND PLACE BACK INTO THE OVEN AND COOK FOR ANOTHER 35 MINUTES AT 180?C. 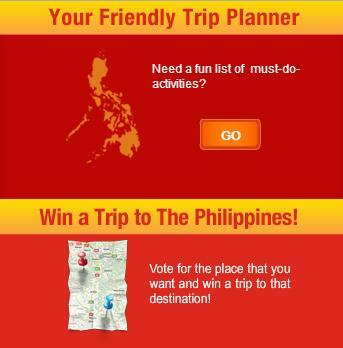 Jollibee Win a Trip to the Philippines Promo- How to Join and Win? How to Join and Win on Jollibee's Win a Trip to the Philippines Promo? 1. The contest is open to females and males 18 years old and above. months from the travel period. relatives up to the 4th civil degree of consanguinity and affinity are disqualified from joining this promo. 4. Promo duration will run from November 26, 2012 to January 18, 2013. 1. Interested participants will be invited to visit the Happy Filipino website: www.thehappyfilipino.com. For more information about the Promo, click here! 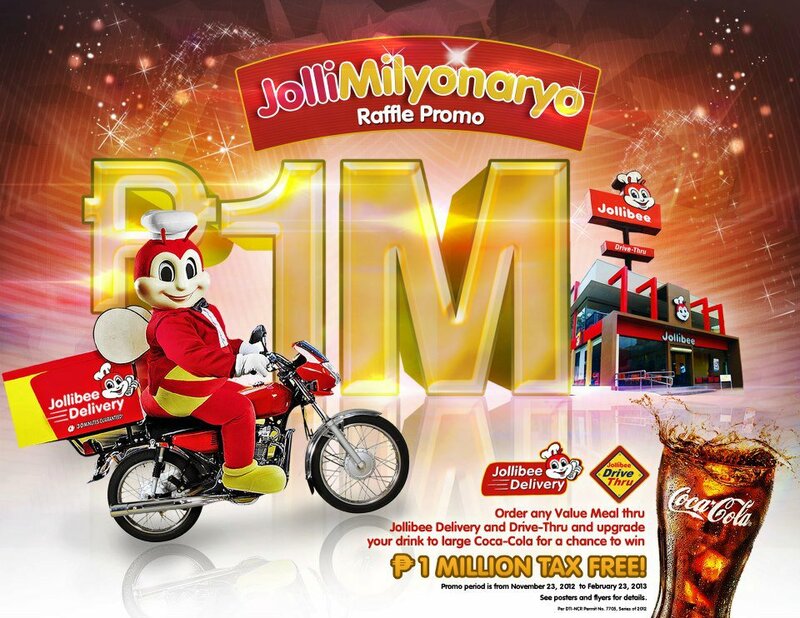 Jollibee- JolliMilyonaryo Raffle Promo- How to Join and Win? How to Join and Win on Jollibee's JolliMilyonaryo Raffle Promo? Are you ready to be a MILLIONAIRE? Then Drive-Thru your nearest Jollibee store or order through 87000 Jollibee Delivery or visit www.jollibeedelivery.com and upgrade any value meal with a Coca-cola product to get you one (1) Raffle coupon to this year's JOLLIMILYONARYO! 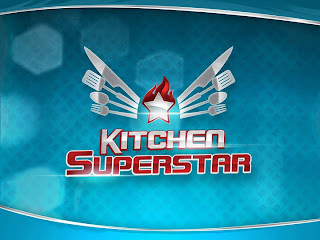 TV5‘s Chef vs. 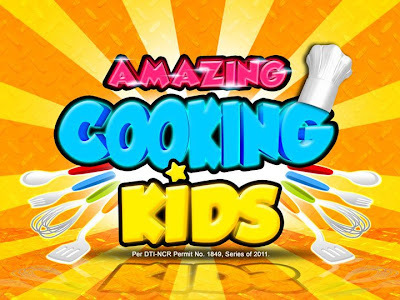 Mom - an ultimate mother and son cooking showdown - won Best Lifestyle Program at the 2012 Asian Television Awards (ATA) held at the Shangri-LaHotel in Singapore last December 6. 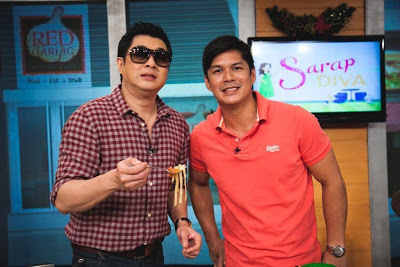 Watch Sarap Diva December 8 Episode with Randy and Raymart Santiago. This Saturday (December 8), Asia’s Songbird Regine Velasquez-Alcasid welcomes into her kitchen the Santiago brothers Randy and Raymart. Regine is treated to Randy's specialty to be prepared "express" and to be served exquisitely. 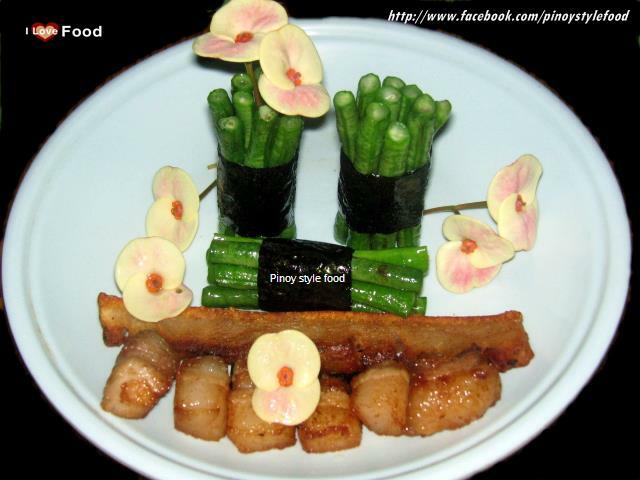 Meanwhile, Raymart treats her to a dish that will soon grace the menu of his very own restaurant, Red Garlic. Listen to naughty and nice stories of the Santiago brothers on growing up, falling in love, and building their respective families. Share the laughter, share the music, and share the love for food with Regine, Randy, and Raymart in Sarap Diva, this Saturday December 8, 9:40am only on GMA. 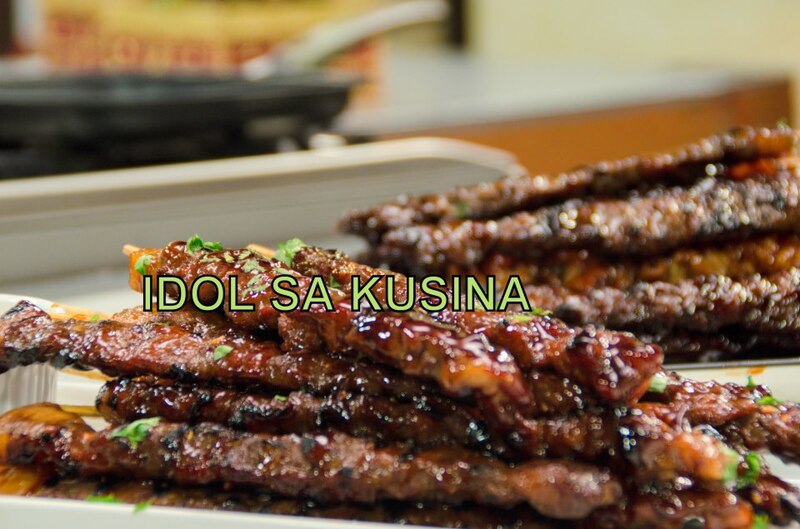 Here's Idol sa Kusina Recipe for Episode 72 / Dec. 9- MAGIC BBQ. 1. Soak bamboo skewers in water for 1 hour. 2. Cut sliced pork into bite size pieces. Lightly season with MAGGI MAGIC SARAP and skew w/ barbeque sticks. 3. To make the barbeque sauce, mix garlic, soy sauce, catsup, sugar and chili. 4. Check seasoning and adjust to preference. 5. Preheat a clean and grill. 6. Brush pork with vegetable oil and grill the pork for 1minute per side. 7. Brush with the barbeque sauce and grill for another minute. 8. Serve immediately with vinegar flavored with garlic and chili. 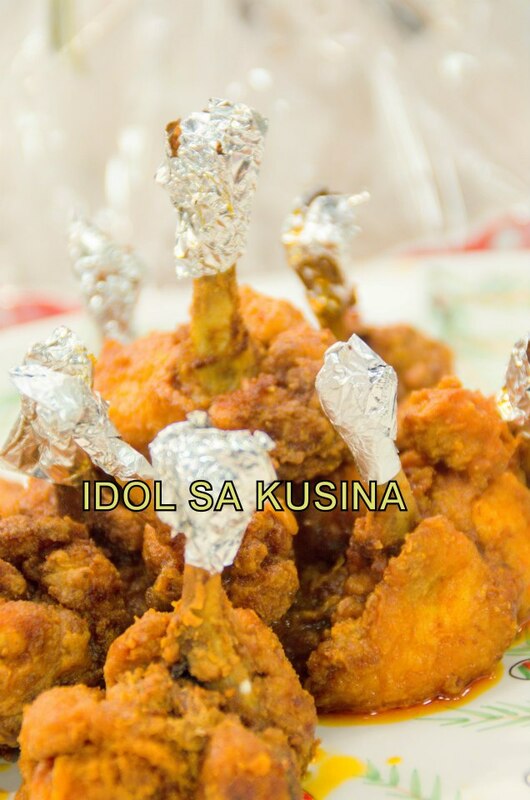 Here's Idol sa Kusina Recipe for Episode 72 / Dec. 2- CAJUN CHICKEN LOLLIPOPS. NOTE, BELOW) AND REFRIGERATE FOR 1 HOUR. TURE ASIDE IN A WARM SPOT. MINUTES. DRAIN ON PREPARED PLATE. THEM WITH THE WARM SPICED BUTTER. SERVE LOLLIPOPS WARM OR AT ROOM TEMPERATURE. 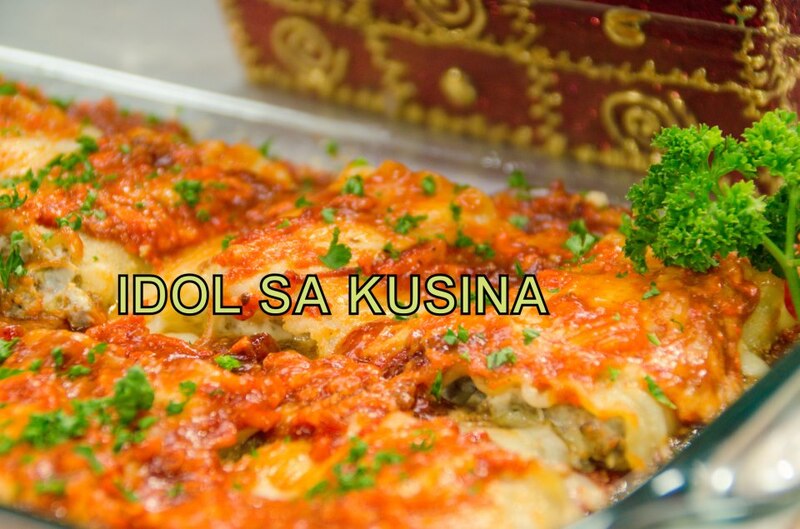 Here's Idol sa Kusina Recipe for Episode 72 / Dec. 2- ROLLED LASAGNA. PREHEAT OVEN TO 350°F. BROWN MEAT IN SKILLET ON MEDIUM-HIGH HEAT; DRAIN. COMBINE SPAGHETTI SAUCE AND STEAK SAUCE. REMOVE HALF OF THE SAUCE MIXTURE; STIR INTO MEAT IN SKILLET. SET REMAINING SAUCE MIXTURE ASIDE FOR LATER USE. MIX EGG, RICOTTA CHEESE AND 1/4 CUP OF THE PARMESAN CHEESE. SPREAD EACH NOODLE WITH 2 HEAPING TABLESPOONFULS OF THE RICOTTA MIXTURE. TOP EVENLY WITH A SCANT 1/4 CUP MEAT MIXTURE AND 2 HEAPING TBSP. MOZZARELLA CHEESE. ROLL UP EACH NOODLE, STARTING AT ONE OF THE SHORT ENDS. PLACE IN GREASED 8-INCH SQUARE BAKING DISH. POUR REMAINING SAUCE MIXTURE OVER NOODLES. SPRINKLE WITH THE REMAINING PARMESAN AND MOZZARELLA CHEESES; COVER WITH FOIL. BAKE 45 MIN. OR UNTIL HOT AND BUBBLY. Here's Taste Buddies Recipe- Malunggay and Basil Pesto. Clean basil and malunggay leaves. Process the basil leaves, sun-dried tomatoes and nuts. Grate the flesh of the coconut/buko to resemble noodles. Mix pesto with the "noodles". Here's Taste Buddies Recipe- Ampalaya Burger. Shape the mixture into patties. Pan fry the patties until cooked.